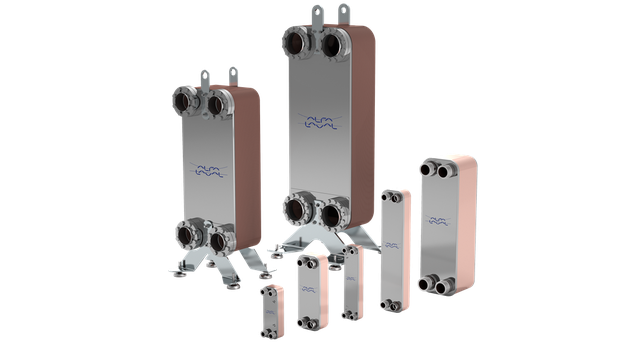 The Alfa Laval CBAQ brazed plate heat exchangers are aimed at HVAC applications. The range is AHRI Certified® through the Liquid to Liquid Brazed & Fusion-bonded Plate Heat Exchangers (LLBF) Certification Program to ensure the thermal performance. The performance certification verifies that the product performs in accordance with the manufacturer's published rating. The heat exchangers are used in applications such as district energy systems, potable water heating and free cooling systems. The CBAQ range of brazed plate heat exchangers has numerous advantages over traditional heat exchangers HVAC installations. The exceptional heat transfer efficiency makes all CBAQ units very compact. As a result, they can tackle large-capacity duties even though there is only limited installation space available. The brazed construction also does away with gaskets, making CBAQ units ideal in applications where temperatures and/or pressures are high. Examples include district heating and a wide range of heating, cooling and tap water solutions. Units in the CBAQ range are available in many different sizes and capacities. A brazed plate heat exchanger consists of thin, corrugated stainless steel plates, stacked into a plate package and brazed together with pure copper. The brazing material seals and holds the plates together at the contact points ensuring optimal heat transfer efficiency and pressure resistance. The plate design guarantees the longest possible life. Brazing the stainless steel plates together eliminates the need for gaskets and thick frame plates. Pressure peaks and rapid temperature cause substantial physical stresses within the materials, and Alfa Laval’s research has focused on the details of these phenomena in order to ensure designs that are extremely resilient and provide a long service life. The plates and connections are made of stainless steel. The brazing material is made of pure copper. 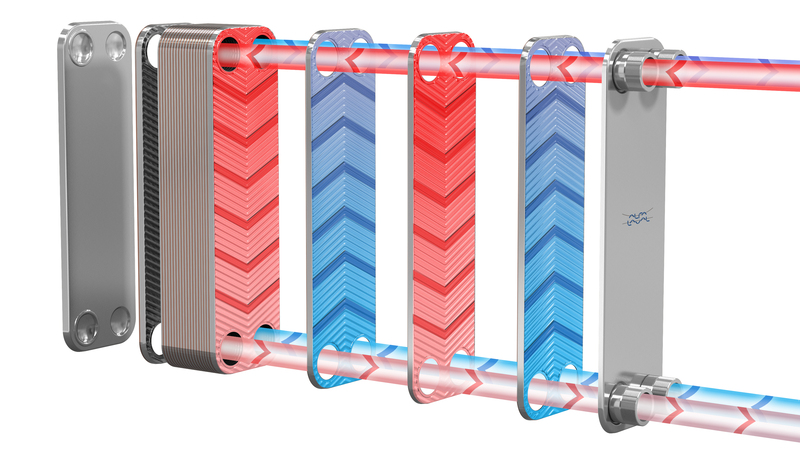 The turbulent flow in the heat exchanger has a self-cleaning effect. Should cleaning still be necessary, learn more on about CIP (Cleaning-in-place).